It’s approaching the end of September and Autumn is definitely in the air. One of the things I always look forward to come autumn, aside from the beautiful fall foliage and the excuse to eat lots of hearty soups and stews, is the harvest of fresh local squash. Acorn, spaghetti and butternut squash along with sweet pumpkin are all favorites of mine. 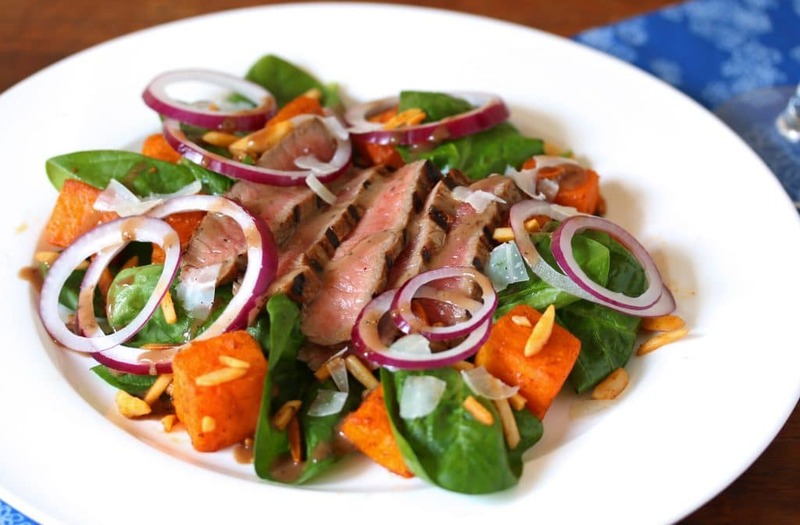 Here is a deliciously satisfying salad that features tender steak, crispy spinach and red onions, crunchy almonds, roasted butternut squash seasoned with aromatic spices and served with a balsamic vinaigrette and shaved Parmesan. Feel free to change up the flavor profile if you like and swap out the spices for something more Italian herb-oriented. Or you can go Greek and use all-purpose Greek seasoning with sliced cherry tomatoes and crumbled Feta instead of Parmesan. Whichever flavor profile you go with, this winning combination of ingredients is sure to hit the spot! If you follow my blog you’ve heard me rave about New Seasons Market on several occasions. 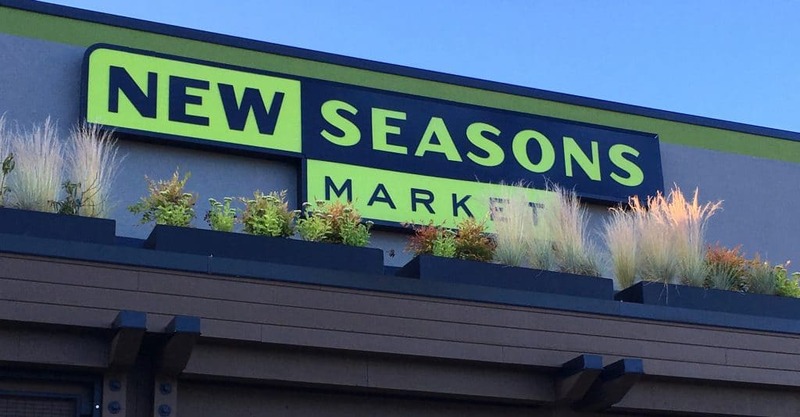 With locations throughout Oregon, California and the recently opened location on Mercer Island, WA with Ballard soon to follow, New Seasons Market features the best of local ingredients and that’s important to me. Whenever I have a choice, I choose local. 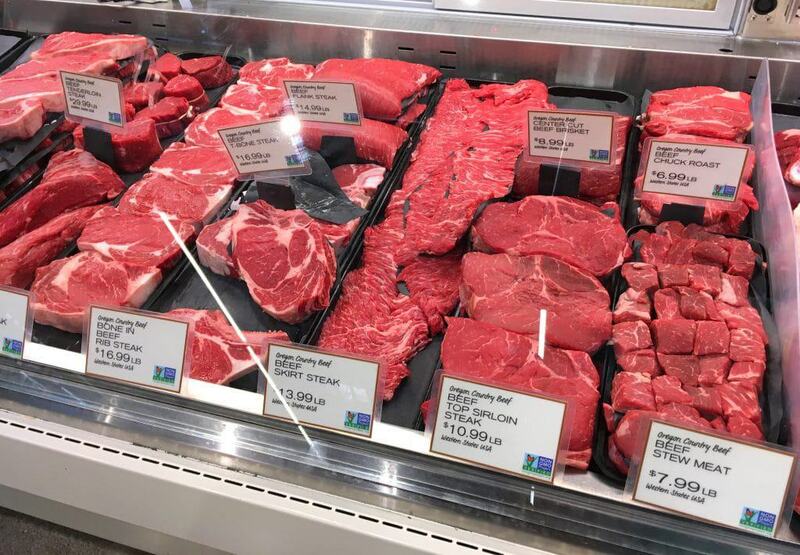 New Seasons makes it easy to find everything I want because most of what they sell comes from local manufacturers, artisans, farmers and ranchers. Case in point: Today’s salad featuring meat and fresh vegetables. I’m able to pick up spinach, red onions and butternut squash grown right here in my area. As for the meat, I don’t have to wonder where it came from. (It’s reeeeally uncomfortable having to wonder, don’t you think?) Everything is fresh and from LOCAL ranchers. I’m able to bring home ingredients to prepare for my family that I feel good about. Prepare the vinaigrette by placing the ingredients in a bowl or jar and whisking or shaking well until emulsified. Place the steak in a ziplock bag with 1/3 cup of the vinaigrette and let it marinate in the fridge for about 4 hours. 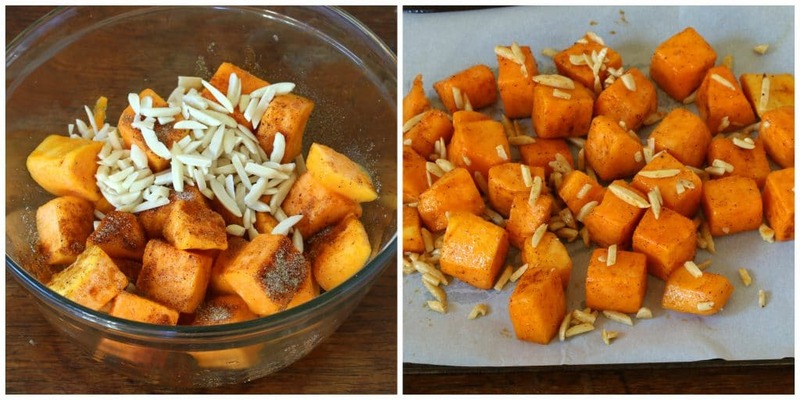 Preheat the oven to 400 degrees F. Place the butternut squash in a large bowl with the slivered almonds, olive oil and spices and stir to evenly coat the squash. Spread the squash on a lined baking sheet and bake for 20-25 minutes or until tender and lightly browned. Let cool but serve while still warm. Discard the marinade and heat a grill, frying pan or griddle over medium-high heat. 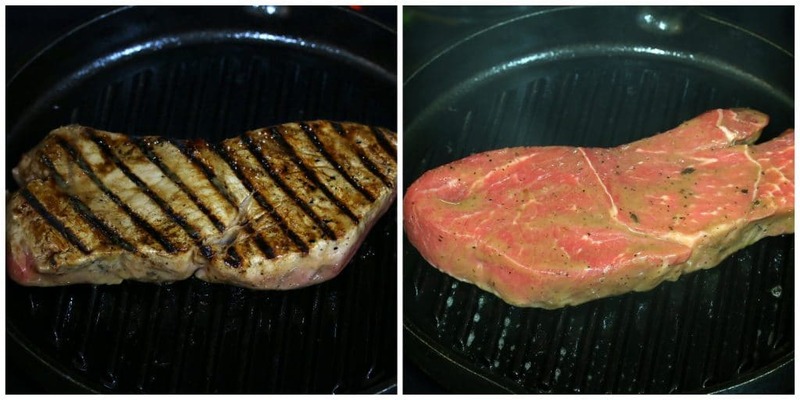 Sear the steak on both sides according to desired doneness. Let the steak rest on a cutting board for a minute and then slice very thinly against the grain. 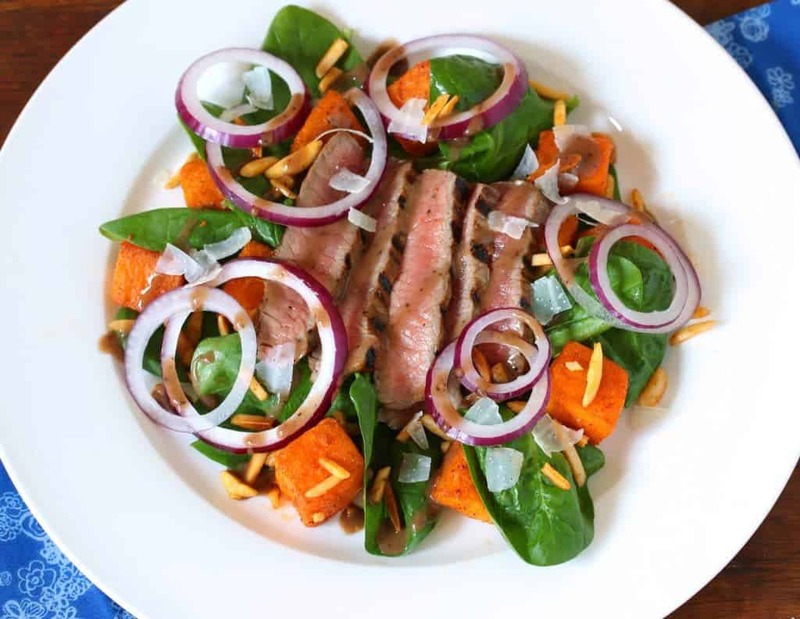 To assemble each salad plate, place the spinach leaves on the plates followed by some warm butternut squash, strips of steak, red onions, drizzle with balsamic vinaigrette and serve sprinkled with cheese. 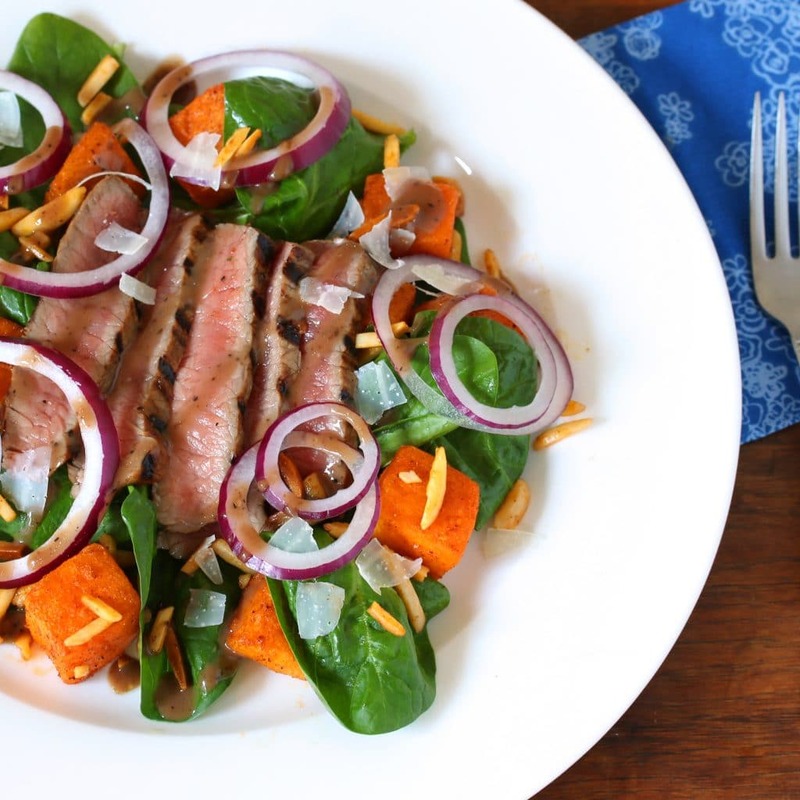 A deliciously satisfying salad featuring tender steak, crispy greens and onions, crunchy almonds and roasted butternut squash tossed in aromatic spices! To make the balsamic vinaigrette, place all the ingredients in a jar and shake well until emulsified. Place the steak in a ziplock bag along with 1/3 cup of the vinaigrette and swish to fully coat the steak. Let marinate in the fridge for about 4 hours. To prepare the roasted butternut squash, place the squash in a large bowl along with the olive oil, almonds, cumin, coriander, smoked paprika, salt and pepper. Stir to combine until evenly coated. Spread the squash out on a baking sheet and roast for 20-25 minutes or until the squash is tender and lightly browned. Towards the end give the mixture a stir every now and then to keep the almonds from burning. Remove from oven and let cool but serve while still warm. While the squash is cooling prepare the steak. Discard the marinade. Heat a grill, cast iron pan or griddle over medium-high heat and sear the steak on both sides according to desired doneness. 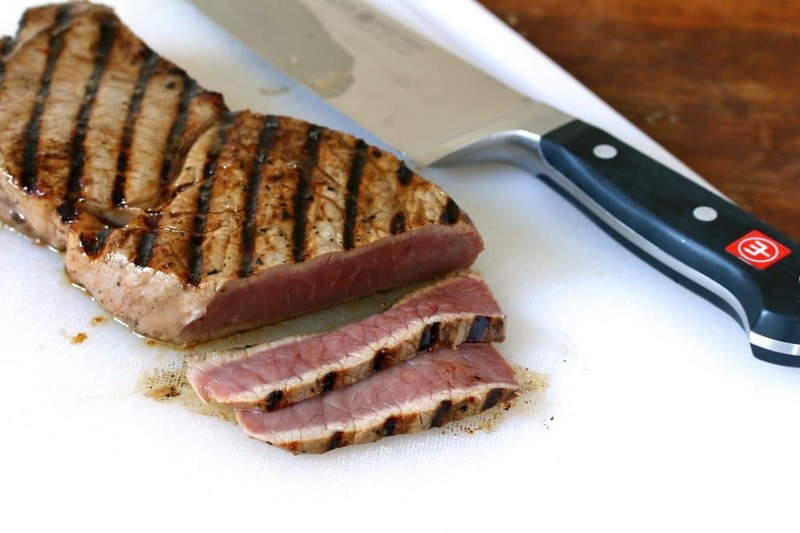 Let the steak rest for a minute on a cutting board and then slice it very thinly against the grain. That looks AMAZING!! I am so ready for lunch right now, lol :) Can’t wait to try this! My husband is a huge steak lover so this will be a perfect way to encourage him to eat more salads! Looks fantastic! I adore roasted squash! 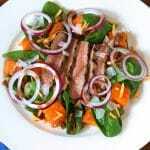 This salad looks beautiful and the steak marinade sounds so delicious. Making this soon! These flavors are so amazing together!! So perfectly combined ! Thank you ! 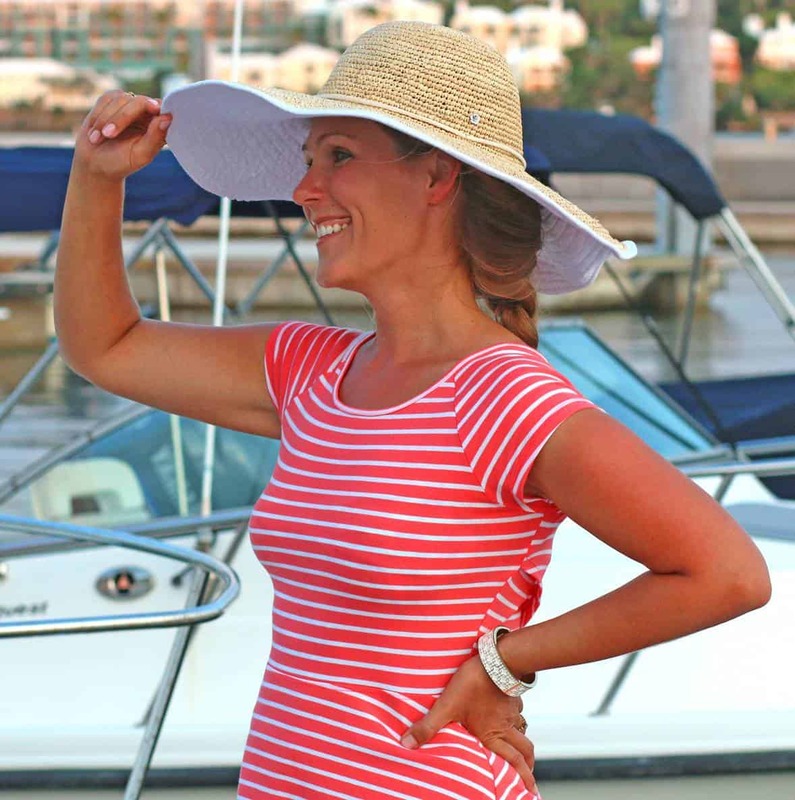 Nothing better than having a great market to count on! This salad really looks like a great one for this time of year — still warm, but excited for the fall! Loving the addition of butternut squash! My husband would love this! Thanks for sharing!! I love steak and I love salad! I know I will love this too!